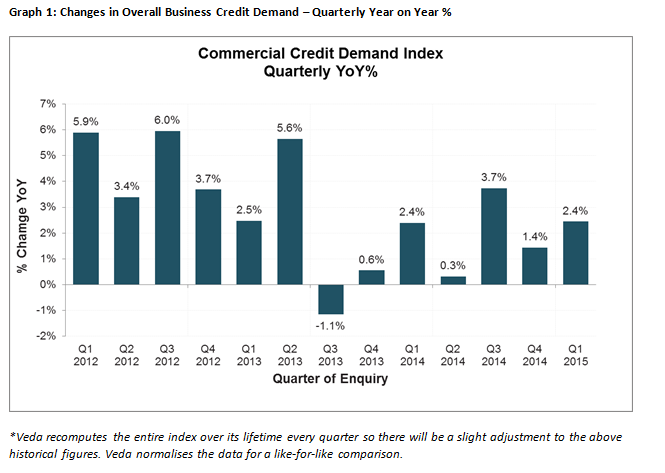 Veda Quarterly Business Credit Demand Index, measuring applications for business loans, trade credit and asset finance, rose at an annual rate of 2.4% in the March 2015 quarter. The increase reflected significant rises in business loan applications (+7.8%) and asset finance applications (+2.2%), offset by a decline in trade credit applications (-2.6%). This marks the first lift in asset finance applications since the June 2013 quarter. The Veda Business Credit Demand Index has historically proven to be a lead indicator of how the overall economy is performing. Veda’s General Manager Commercial Credit, Moses Samaha, said: “During the March quarter we saw signs of a pick up in business credit growth, after a softer December quarter. Growth in business loan applications was the strongest it has been since the December 2013 quarter, and we saw positive asset finance application figures for the first time in seven quarters. “Non-mining states – NSW, Victoria, Tasmania, the ACT and South Australia – performed strongly in the March quarter, recording an annual growth rate of 3.4%. However, despite these promising signs, business investment is being held back by the soft business credit growth in the mining states,” he said. The pace of growth in overall business credit applications accelerated in the March 2015 quarter. Victoria (+3.7%) and NSW (+3.0%) experienced positive growth in business credit applications. In contrast, mining states showed weaker business credit demand in the March quarter, with Queensland (+0.8%) and WA (+0.5%) growing more moderately. There was strong growth in b usiness loan applications, which rose 7.8% in the March 2015 quarter. This growth was seen across both the mining and non-mining states. NSW (+9.5%), Queensland (+9.5%), Victoria (+6.0%) SA (+14.2%) and the ACT (+10.1%) all experienced solid growth in business loan applications. While growth was more modest in WA (+1.8%), it has picked up from the contraction in business loan applications seen in the December quarter 2014. The growth in business loans was driven in large part by the increased growth rate of mortgage applications (+13.1%) and credit cards (+15.7%). Applications for premium finance (+3.2%) and overdrafts (+4.5%) also grew, while lending proposal applications (+5.4%) remained solid despite the annual growth rate easing in the March quarter. “Recently we’ve seen an upswing in business loan pledges by banks and other lenders. The increased competition in this space has created an attractive lending market for SMEs and contributed to the growth of business loan applications,” Mr Samaha said. Asset finance applications picked up in the March quarter (+2.2%). After experiencing sharp falls throughout much of 2014, asset finance applications continued to recover across the mining states in the March quarter. The NT (+3.3%) recorded a strong turn around in asset finance applications, while Queensland (-2.9%) and WA (-0.9%) experienced much more modest declines compared to the March 2014 quarter. Across the non-mining states, ACT (+18.0%), Victoria (+6.8%), SA (+3.5%) and NSW (+2.2%) all saw positive growth in asset finance applications. Tasmania (-6.2%) recorded the largest contraction in applications. Within asset finance, there was an improvement seen across the commercial rental (+15.3%), hire purchase (+4.3%) and personal loan (+3.2%) categories. However, leasing (-3.9%) showed a decline in applications. “One year post the mining boom, it appears we may now be seeing what could be the new norm in growth rates for asset finance. There also appears to be a small return to growth in auto finance and IT asset finance in the market,” Mr Samaha said. Trade credit applications fell in the March quarter (-2.6%). Significant drops in trade credit applications were recorded across the NT (-11.4%), Tasmania (-7.8%), SA (-5.6%), Queensland (-4.3%), NSW (-2.7%) and Victoria (-1.3%). Only the ACT (+6.9%) and WA (+0.2%) maintained positive trade credit growth in the March quarter. “The fall in trade credit applications is in line with the long term trend of softening trade credit demand. Softer trade credit conditions could be an early sign of moderate business confidence amongst non-lending credit providers,” Mr Samaha said. The Veda Quarterly Business Credit Demand Index measures the volume of credit applications that go through the Veda Commercial Bureau by credit providers such as financial institutions and major corporations in Australia. Based on this it is a good measure of intentions to acquire credit by businesses. This differs to other market measures published by the RBA/ABS, which measure new and cumulative dollar amounts that are actually approved by financial institutions. © Copyright 2014 Business Information Industry Association. All Rights Reserved. Site development and maintenance provided by Lakefront Media, Inc.